An old woman, both a hermit and a hoarder, is dying in Great Barrington, Massachusetts. While cleaning out her dilapidated house, her estranged daughter, Liza Machett, discovers a fortune in hundred-dollar bills. For Liza, the money seems like a blessing—until an elderly man she's never met appears at her mother's funeral, warning that she's in danger. Suddenly, Liza's quiet life is turned upside down. Terrified, Liza sets off on a perilous cross-country journey that will lead her to Cochise County, Arizona, where Sheriff Joanna Brady is embroiled in a personal mystery of her own.Junior Dowdle, a developmentally disabled man in his sixties, is found dead in a limestone cavern near Bisbee. Inside the cave, the police also discover a badly injured kitten, as well as the remains of other mutilated pets. Though he'd always been kind and sweet, with the onset of dementia, he had begun having violent episodes. Could he have hurt those animals? Was his death an accident? Or is he a victim as well? Joanna and her modest staff have their hands full as another case rocks the department—a shocking murder involving Liza and the money. The undaunted sheriff must solve these two disturbing cases fast, before more innocent blood can be shed. Sometimes it is through necessity that the best experiences are born. Such is the career of author J. 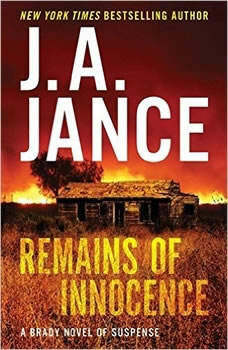 A. Jance, who after many years of wanting to become a writer, found her way to that end. However, it took a lot if sacrifice and detours before she finally became the writer she always wanted to be. Upon being denied admittance into a creative writing class by a professor who thought women belonged at home or in teaching, she gave up and married a young man who aspired to be another Faulkner or Hemingway. The only similarities to those writers was his love for alcohol. He became a severe alcoholic and proclaimed to his wife, whom he knew wanted a writing career, that he would be the only writer in that family. She grew weary of his addiction, and divorced him just two years before he died at a very young age. Jance had been writing when he was away or asleep, but she now had to find a way to support her children as a single mother. She spent her days selling insurance and her nights writing......many times writing all night. After the disappointment of not having her first book published, her agent advised her that she might be best at writing fiction. She followed that advice, and has written 22 Detective Beaumont books, 17 Joanna Brady books, and 10 Ali Reynolds books. There were also four thrillers added to the body of work. Jance says that one of the best parts of writing is hearing from fans that her books have helped many as they were going through illness, or were sitting with a loved one who was going through difficult times. She says........"it gratified me to know that by immersing themselves in my stories, people are able to set their own lives aside and live and walk in someone else's shoes. Jance feels that she is doing the best job that she can at the best job in the world.